Combining culture and nature, the Berlin Wall Trail follows the path of the former division of the city that was built on August 13, 1961. It's a great way to explore Berlin and discover the last remains of the Cold War. The Berlin Wall divided West and East Berlin for 28 years. Almost as many years have gone by since reunification in 1990, progressively erasing the differences between both former cities. Still, one of the best ways to explore the remaining traces of the Cold War is the Berlin Wall Trail. This round tour covers some 160 kilometers, identified with the sign "Berliner Mauerweg." The tour can easily be started anywhere you want, as bikes can be brought on Berlin's public transport network. An interesting place to begin is the Berlin Wall Memorial. Following the Wall's former location on Bernauer Strasse along 1.4 kilometers, it shows how the border fortifications were set up and pays tribute to the people who fled East Berlin as well as to the victims of the death strip. These lines of cobblestones will help you recognize the exact former location of the Wall in the center of the city. However, it is not continuously documented this way throughout the urban part of the border, which covered some 40 kilometers. When the Wall came down on November 9, 1989, East and West Germans were eager to get rid of all traces of it. Following the bike path down towards Mitte, you will reach the government district by the Spree River and the Brandenburg Gate. 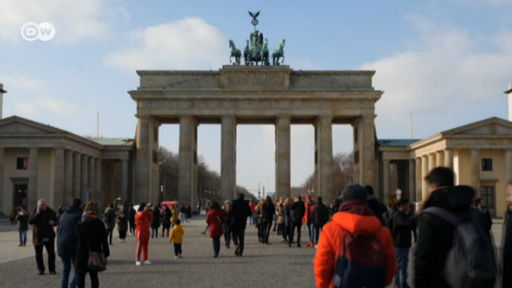 This famous Berlin landmark landed in a no-man's land after the Wall was built. Although the Wall officially blocked it from West Berlin, a smaller wall also restricted access to the monument for East Germans as well. Checkpoint Charlie remains the most famous former crossing point between East and West Berlin. Tourists now stop there to get their picture taken with actors dressed as military policemen and of a replica of the famous sign: "You are leaving the American sector." If ever you're tempted by a Red Army hat or a gas mask sold there, be aware that many rather see this spot as a Cold War Disneyland. More than 300 watchtowers used to overlook the Berlin Wall, allowing border guards to catch people trying to flee East Berlin. Only a few were left standing, such as this mushroom-shaped surveillance platform near Potsdamer Platz, now listed as an historical monument. Larger, square towers later replaced this model from 1966. An example of this type of tower can be found near Treptower Park. Another classic attraction that can't be missed on the Berlin Wall bike path is the East Side Gallery. International artists painted this 1.3-kilometer-long remaining stretch of the Wall in 1990, making it one of the longest open-air galleries in the world. This depiction of Leonid Brezhnev and Erich Honecker kissing is one of the most iconic paintings of the gallery. Beyond the urban section of the bike path, the route continues through the suburbs of Berlin. Just before reaching Potsdam is the Glienicke Bridge, where spies used to be exchanged during the Cold War. A 1962 trade of a KGB agent for an American pilot that took place here is featured in Stephen Spielberg's recent film, "Bridge of Spies." Many villas can be spotted in that area too. Large parts of the bike route are in the middle of the forest, allowing you to realize how green Berlin and its surroundings still are. Right on the bank of the Havel River, this watchtower in Hennigsdorf, about 20 kilometers northwest of Berlin, houses a small museum on the history of the Wall and how it affected that town. It is free to visit. Returning to the city, you'll be greeted by a cherry tree avenue in Pankow, which is most spectacular towards the end of April, when the trees are in full bloom. The Japanese donated some 10,000 trees "to bring peace in the hearts of the people." They were planted in different sections of the former Wall. This avenue is right by Bösebrücke, the first crossing to open on the day the Wall came down. A veteran of Berlin's nightlife scene, Smiley Baldwin served in the American military, patrolling the divided city in the 80s before he became a doorman. The documentary "Berlin Bouncer" profiles his unusual story. 2019, 30 years after the fall of the Berlin Wall: in this anniversary year, Berlin's local government is splashing out on an extensive renovation program. The popular tourist route is to be renewed and made barrier-free. Thirty years ago, border guards gunned down Chris Gueffroy as he attempted to flee across the Berlin Wall into West Germany. The 20-year-old was the last person to be shot trying to escape the East German dictatorship. Twenty-nine years after the fall of the Berlin Wall, Thailand's capital Bangkok now also has a work of art made from original pieces of the wall.